for candidates of all ages at all levels. at all levels of experience and ability. Our exams assess and promote the skills needed for effective communication in real life. They're available to individuals, schools and colleges in more than 60 countries. Trinity ESOL exams assess and promote the skills needed for effective communication in real life. Trinity College London is an international exam board with a rich heritage of academic rigour and a positive, supportive approach to assessment. 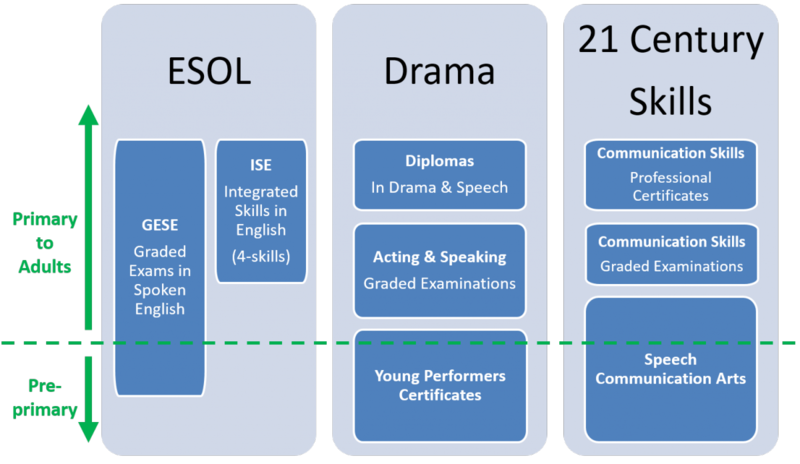 We provide pathways of recognised and respected qualifications across a unique spectrum of communicative skills, including English Language, Drama, 21st Century Skills, and TESOL. Trinity assessments are specifically designed to help students progress. They inspire learners and mark their achievement at each stage of their development and at all levels of competence. At the heart of Trinity’s work is the support we provide for teachers, both in terms of specific support for teachers preparing candidates for our exams, and more general teacher development. Trinity exams are regulated by Ofqual (Office of Qualifications and Examinations Regulation) and recognised internationally. As students progress through school, higher education and into employment, their motivation for learning evolves. Trinity provides flexible pathways to support each individual’s learning journey, made up of clear, achievable steps.